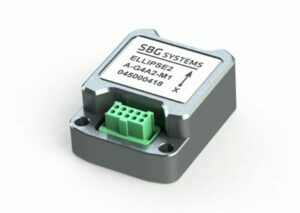 SBG Systems has announced the release of the Ellipse 2 Micro Series, a new product range of reduced size and cost high performance inertial sensors for unmanned aerial vehicles (UAVs) and other unmanned vehicles. The Ellipse 2 Micro Series is available as an IMU (inertial measurement unit), or as an AHRS (attitude and heading reference system) or INS (inertial navigation system) running an Extended Kalman Filter. “With the Ellipse 2 Micro, integrators benefit from SBG Systems’ high expertise in motion sensing and positioning in the smallest package,” said Alexis Guinamard, CTO of SBG Systems. The new Ellipse 2 Micro is available as an IMU for calibrated sensor data, or as an AHRS/INS delivering accurate orientation and navigation using an external GNSS receiver. Combining state-of-the-art MEMS-based gyroscopes, accelerometers, and magnetometers, the new Ellipse 2 Micro Series is fully calibrated in temperature to eliminate measurement errors such as sensor bias, gain, linearity, alignment, and g-sensitivity to provide a constant behavior in all conditions. The SBG Systems has been manufacturing inertial sensors for more than 10 years, and the company’s R&D team has been adjusting motion profiles to platforms (UAV, car, vessels, etc.) and specific conditions (vibrations, high dynamics, low motion, etc.) to reach high levels of reliability. Weighing 10 grams, the Ellipse 2 Micro provides a 0.1° accurate attitude and connects to external GNSS for navigation, offering an excellent weight/performance ratio to integrators. Ellipse 2 Micro Series provides high-quality navigation data when connected to an external GNSS receiver. The Ellipse 2 Micro INS fuses in real-time inertial and GNSS information to maintain vehicle position in air, marine, or in land applications. For automotive projects, the inertial sensor comes with CAN protocol and connects to odometers for high performance in harsh environments (tunnel, urban canyons, etc.). The Ellipse 2 Micro also provides heave data which automatically adjusts to the wave frequency. With accurate orientation, navigation, and heave features, the Ellipse 2 Micro Series is ideal for applications such as motion monitoring, wave measurement, stabilization and orientation of onboard equipment (camera, antennas, side-scan echo sounders, etc. ).